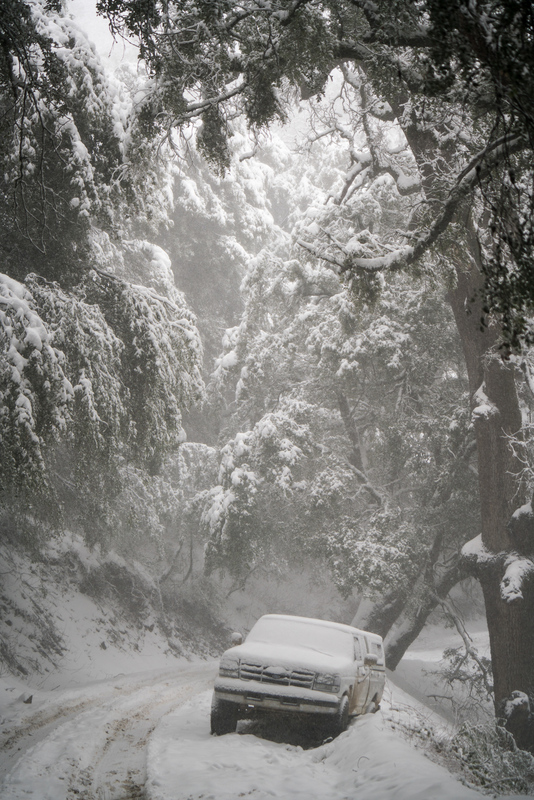 Snow is accumulating at an unprecedented rate in the coastal hills and mountains of California. 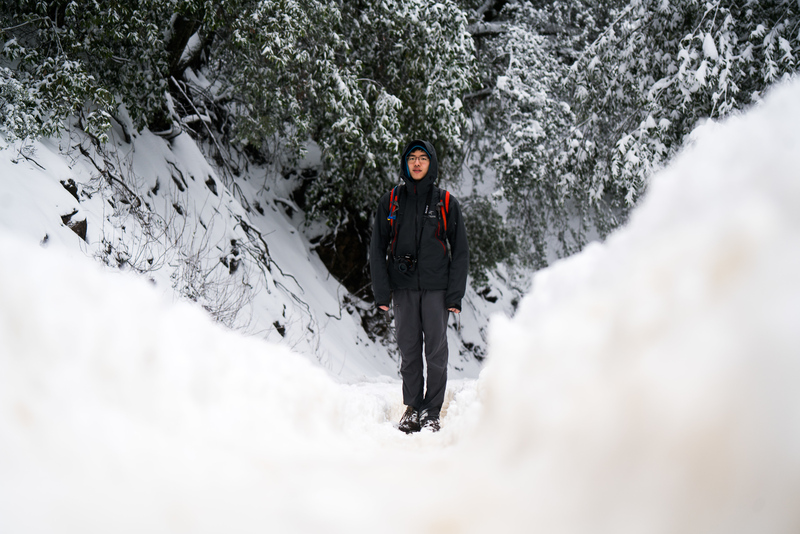 Last week it snowed lower than 1,000 feet elevation in the hills around the Bay Area, and for the last 8 days at higher elevations in the coastal mountains from San Luis Obispo to San Fransisco, snow continues to accumulate on the ground by the foot. THIS. DOESN'T. HAPPEN. ANYMORE. Full solar eclipses are less rare than this. 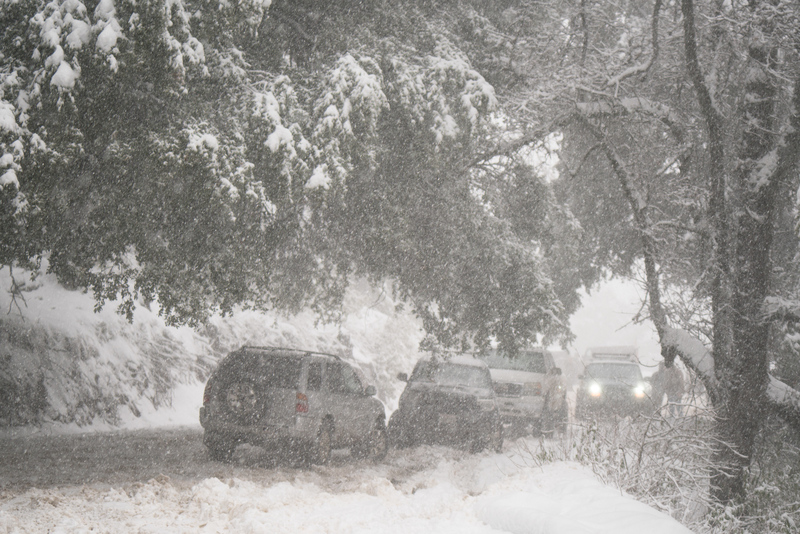 California has not seen a series of storms this big and this cold in more than a decade. 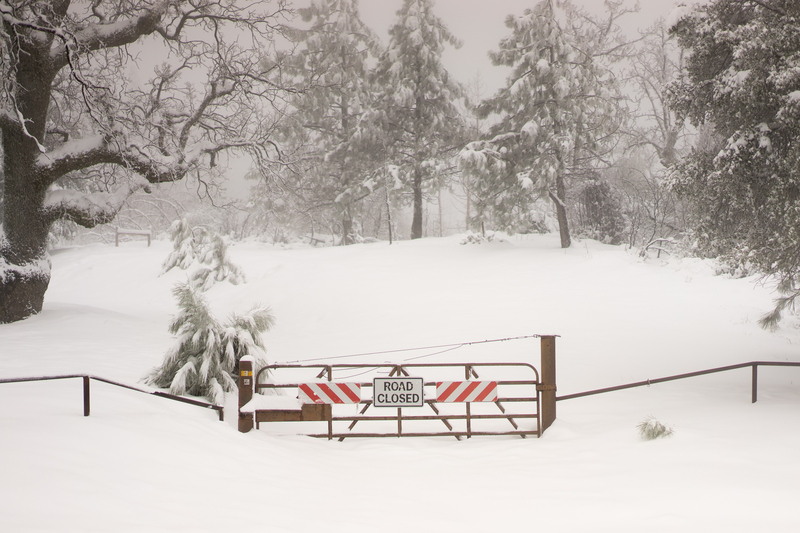 NOAA was even issuing blizzard warnings for the central coast. I've never seen that before. Weather like this is in the 21st century is unprecedented. I had to photograph it. 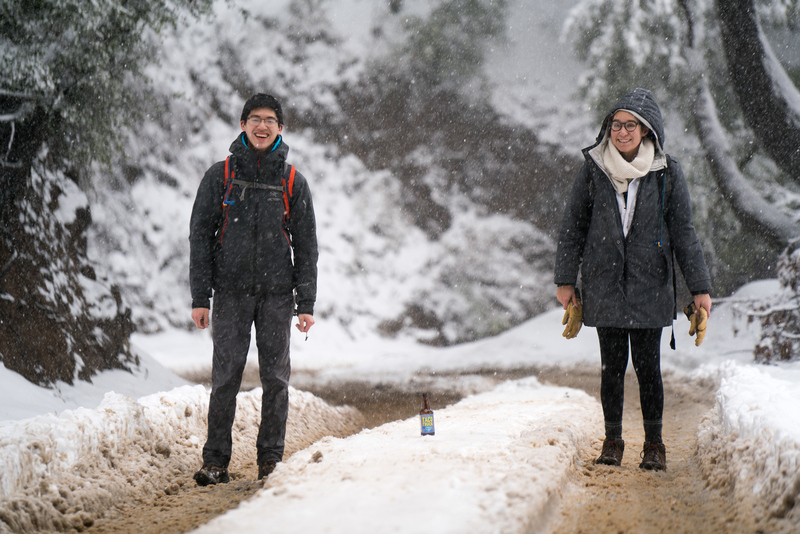 📷: @xelanil and I trekking through the snow Yesterday. I'll share my photos below. 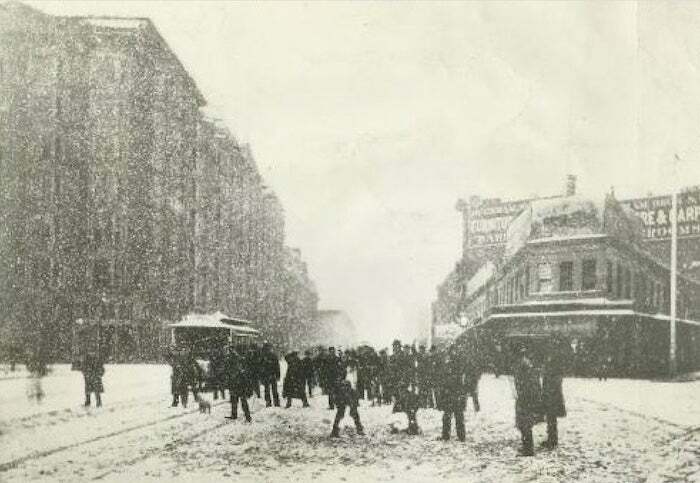 But first, who else saw the snow? Please share photos if you have any. 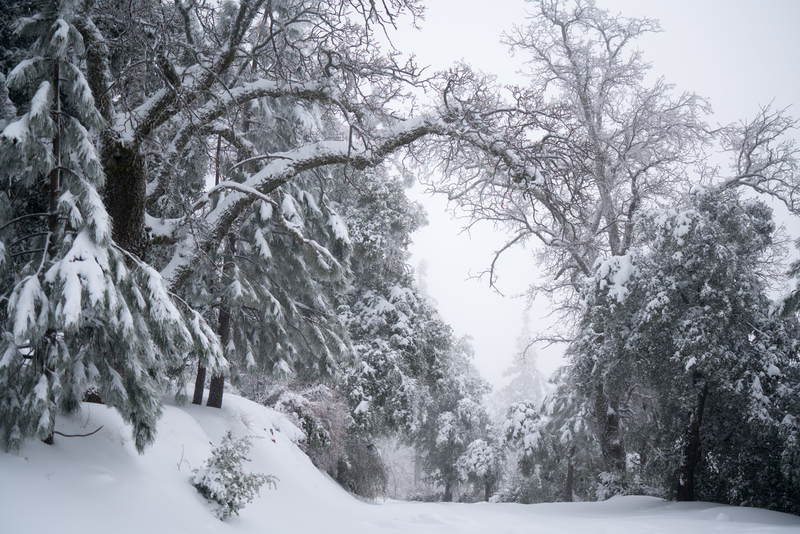 The upward trajectory of the average low temperatures in California storms screams that weather like this might never happen again, so I made it a point to capture the intensity and beauty of the coastal snow. Yesterday, I hiked through the San Lucia Mountains of the Big Sur Area. I grew up backpacking in these mountains. Never have I seen snow in them until yesterday. We found WAY more snow than expected. 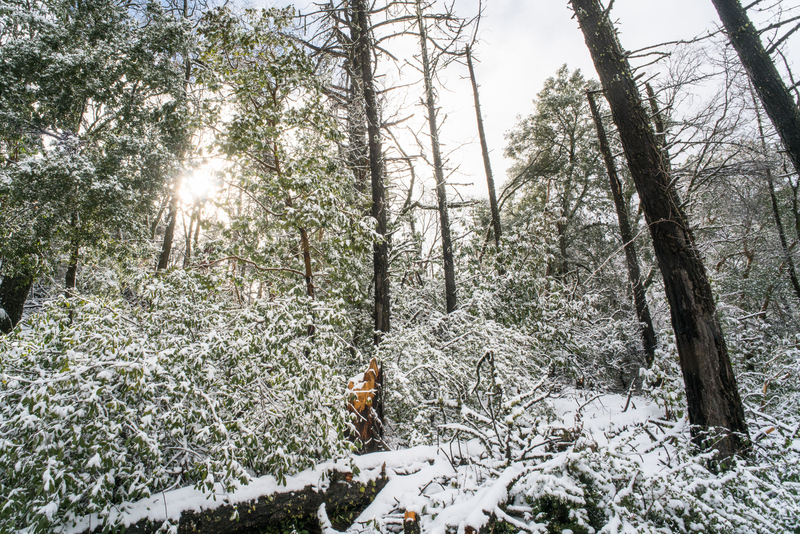 Seeing the native plans including coast live oaks, Pacific madrone trees, and redwoods caked in the snow was unbelievable. 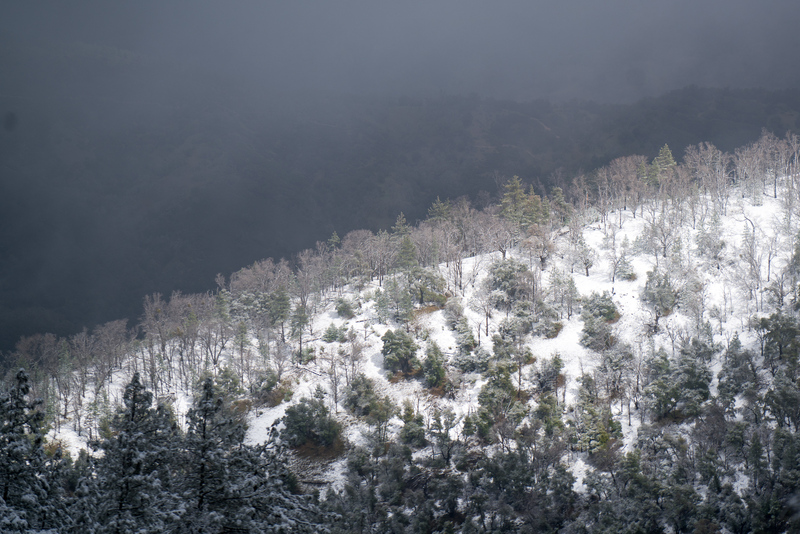 The San Lucia Mountains are ~2625 square miles of low elevation mountains that start right at the Pacific. They stretch from Monterey to San Luis Obispo. Their proximity to the Pacific keeps them fairly warm. The ocean never gets colder than 50F in that area, which protects the area from freezing storms that bring snow. 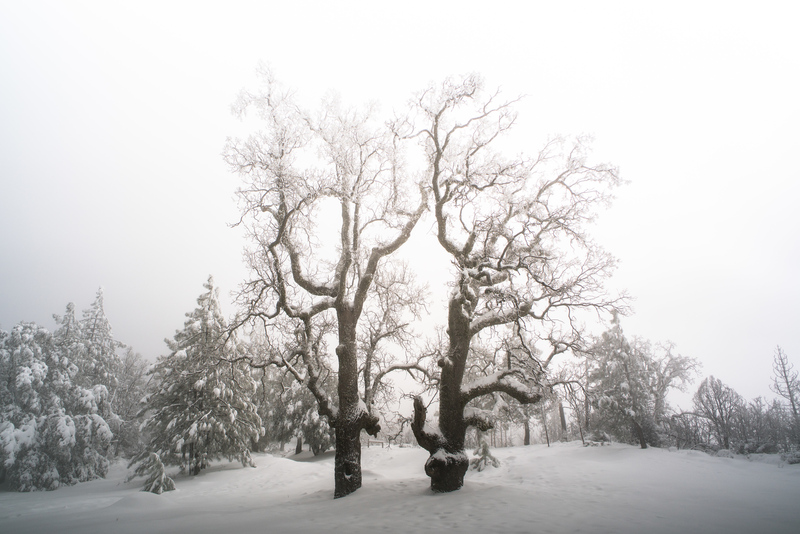 Only the tallest peaks get dusted with snow, many less than once a year, and the low oak and redwood forests almost never see snow. 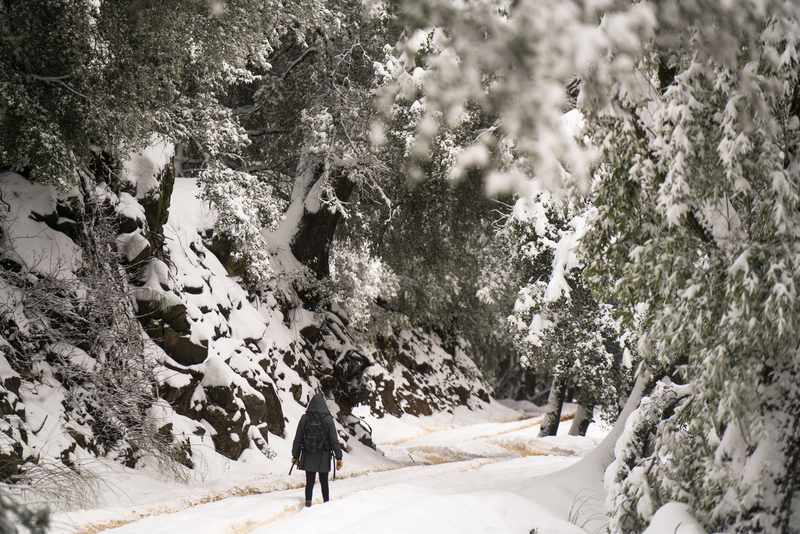 My girlfriend Marie, @xelanil and I ventured into the San Lucia Mountains via Tassajara Road. 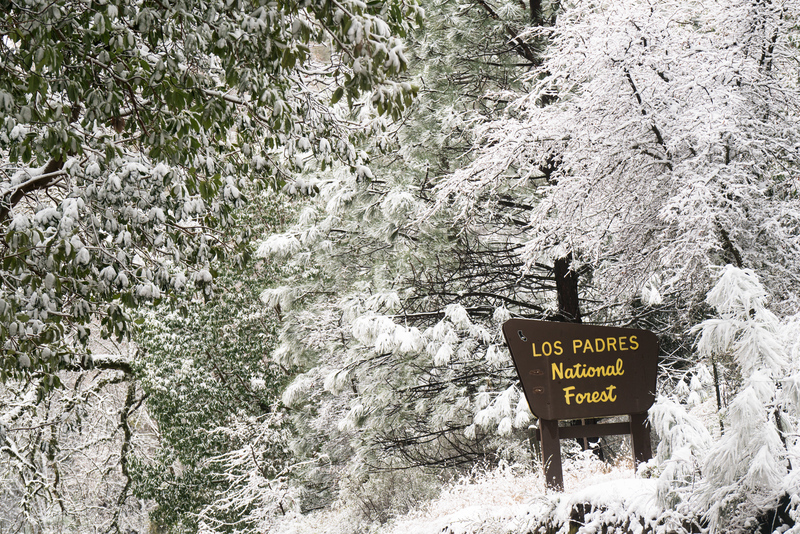 It's a legendary 4x4 road that provides ample access to the backcountry of Las Padres National Forest, Ventana Wilderness, and Julia Pfeiffer State Park. 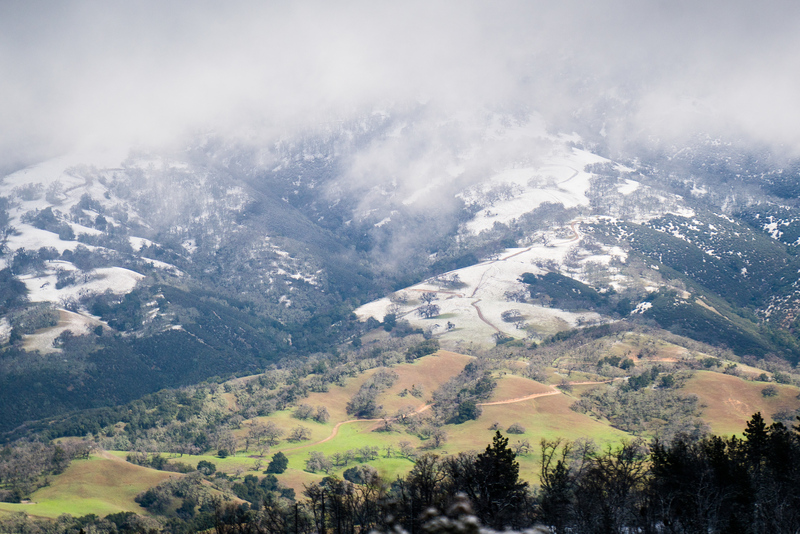 It parallels the Big Sur Area of Highway 1 via a single lane dirt road that traces iconic ridgelines. 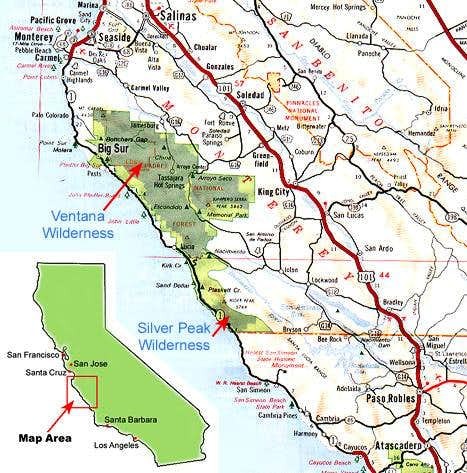 Our plan was to hike the Pine Ridge Trail from China Camp Campground to the Ventana South Cone. Atop the peak, we would see dozens of ridges, the ocean, and Julia Pfieffer State Park of Big Sur. 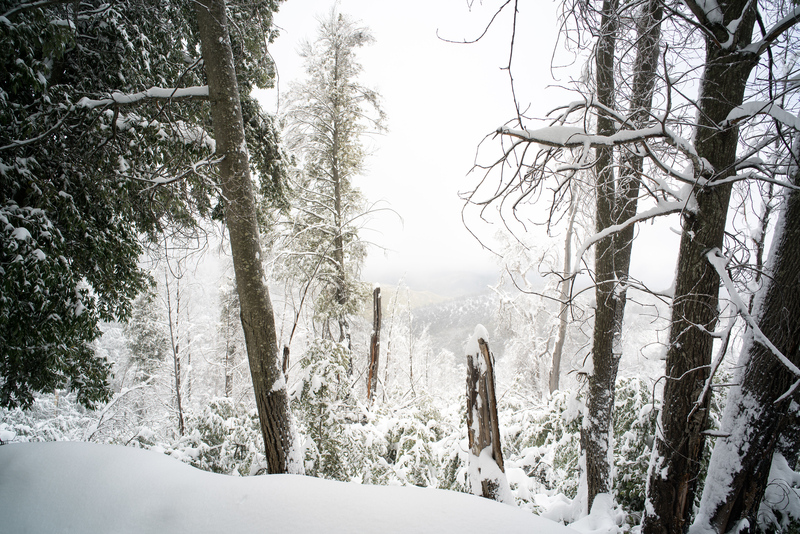 We started to see coated trees lower than 2,000'. 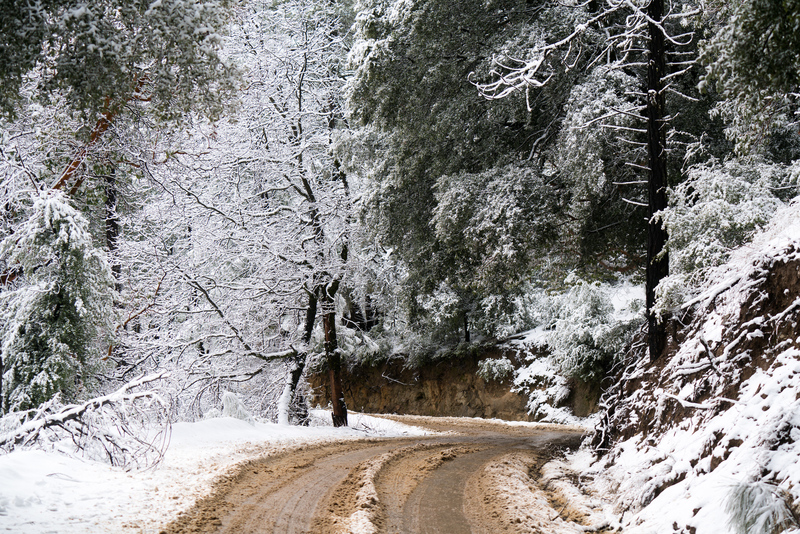 There's no snowplow service in these mountains because the roads rarely see snow. We parked my Subaru at this puddle, with many miles of dirt road between us and the trailhead. Driving a Subaru on a 4x4 dirt road in the snow and mud with no emergency services is asking for a disaster. We set out on foot with a new goal to get to Chews Ridge, which is the first major vantage point on Tassajara Road. We weren't thrilled that our planned hike turned into walking a dirt road. The tire tracks in the road quickly turned from dirt to slippery ice, and this confirmed that my decision to ditch the Subaru was the right one. 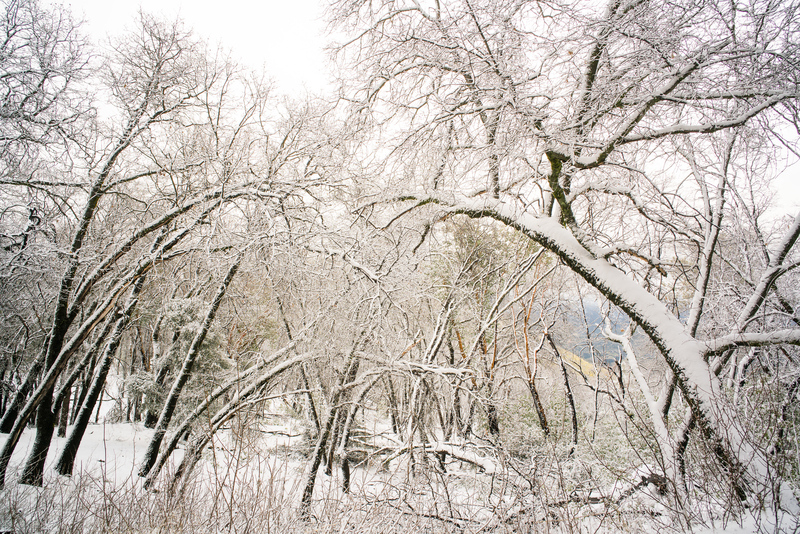 But quickly it turned into a winter wonderland. I was ecstatic that we were in the right place at the right time to capture the historic weather. 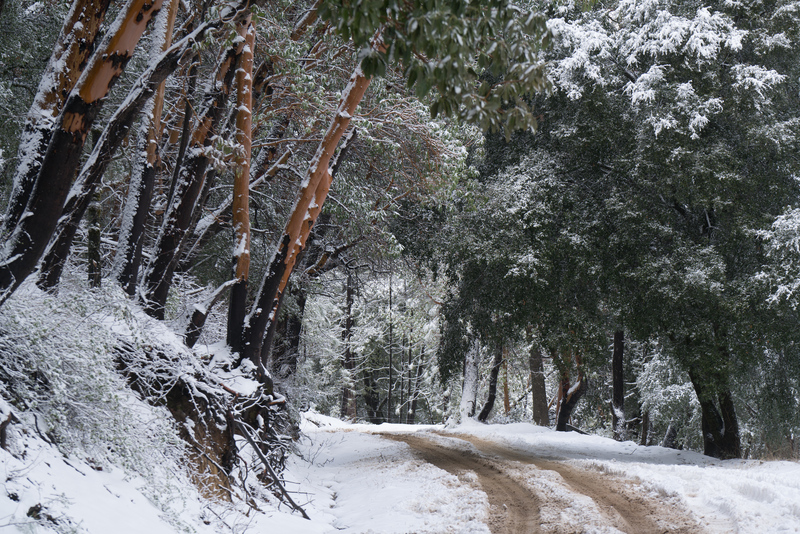 4x4 trucks and SUVs raced past us as we traversed their tracks. My 4x4 SUV sat on snowless ground. The snow kept getting deeper and deeper. Soon there was 6 inches of snow. 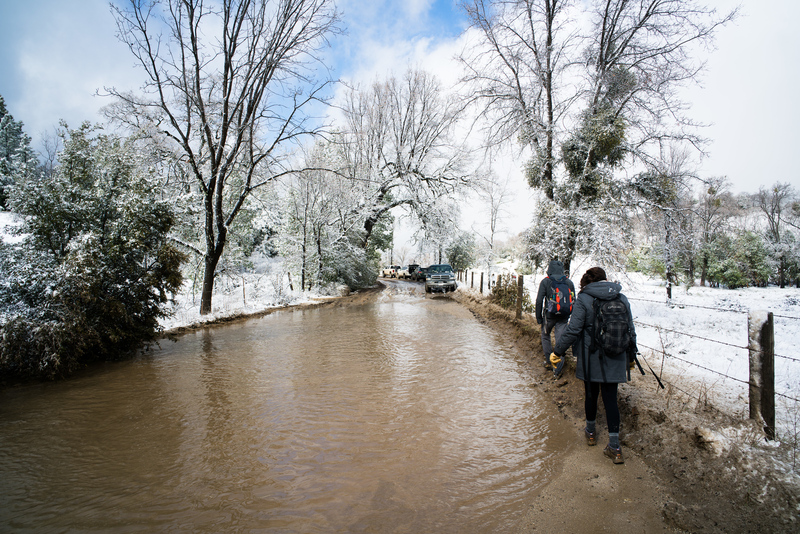 We passed the high point of the 4x4 trucks when the snow got one foot deep. I was glad we were on foot. Watching trucks slide down the road was scary. Someone ditched this truck that was teetering off the edge of a near-cliff hillside. Beyond the trucks was virgin powder. The snow on the road was untouched. 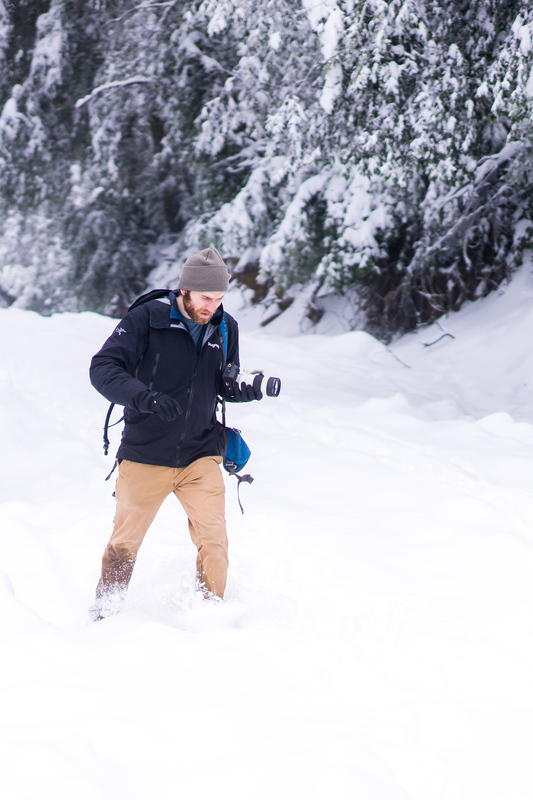 Here's a photo @xelanil took of me trudging through the snow. The views were spectacular. 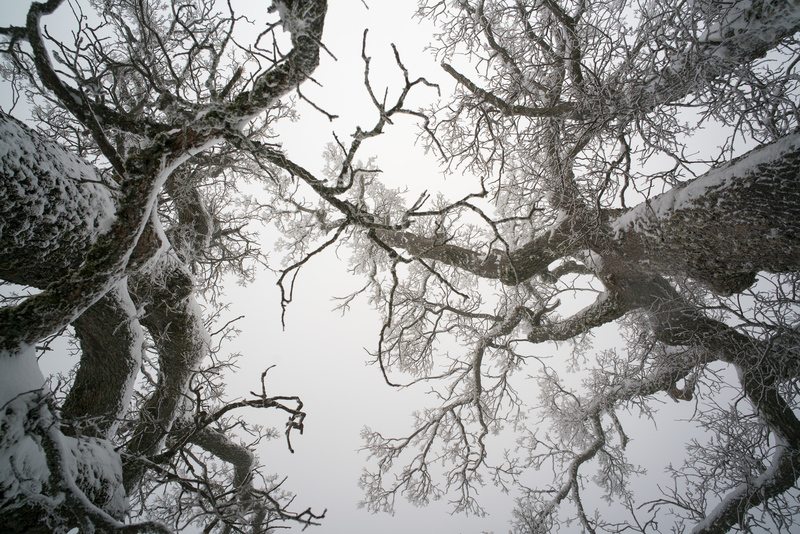 This vegetation never sees snow, so the sights were both beautiful and strange. It felt like we were in Sierras. Amazing! 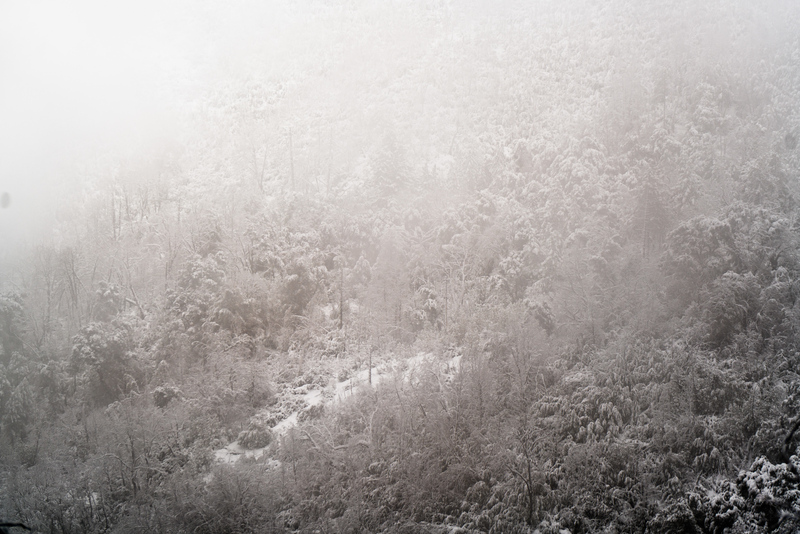 I love the 2nd photo in the set - the contrast of snow-covered and not is pretty special. We made it to Chews Ridge. No views for us because it was in the clouds. This is what the view looked like about a year earlier on 12-23-17. This is what we saw on 2-10-19 instead. It was too snowy to walk to the edge. But oh my it was epic. Look how deep the snow was. 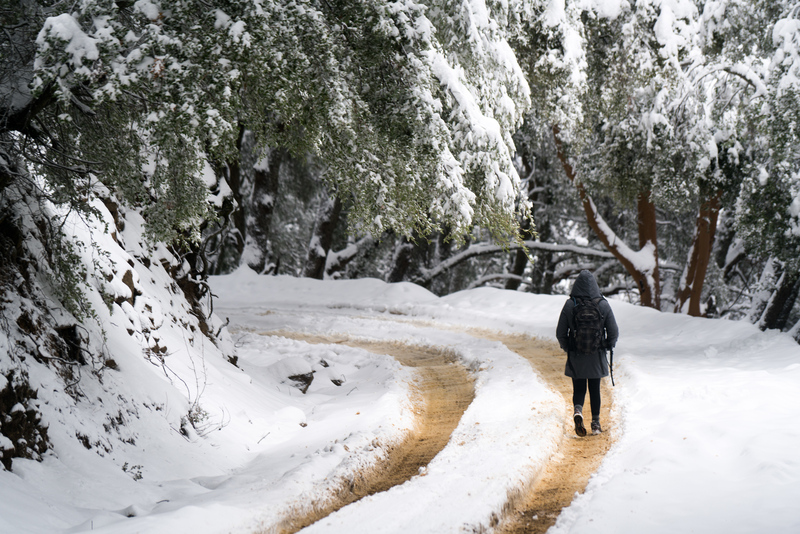 This last week has been a cold reminder of what California once had for its climate. Now, we have super fires and multi-year droughts. But this week I'm going to celebrate that amazing. 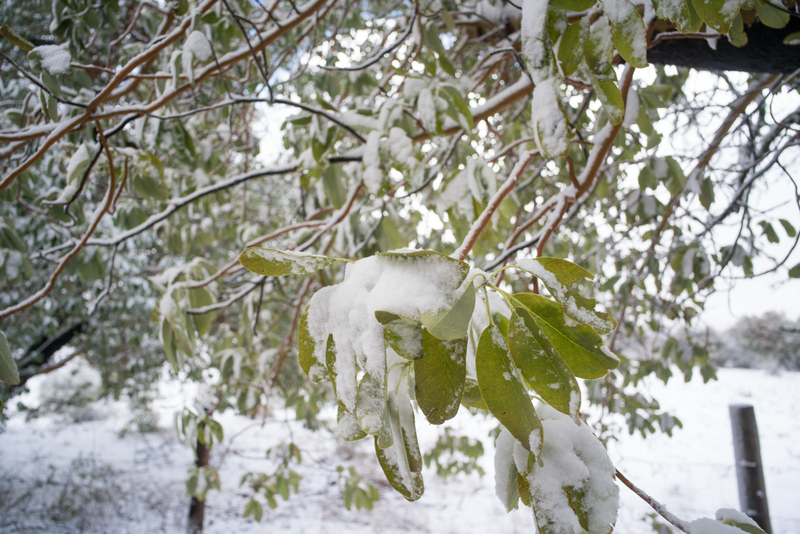 So here's are some more photos of plant life that rarely experiences snow. 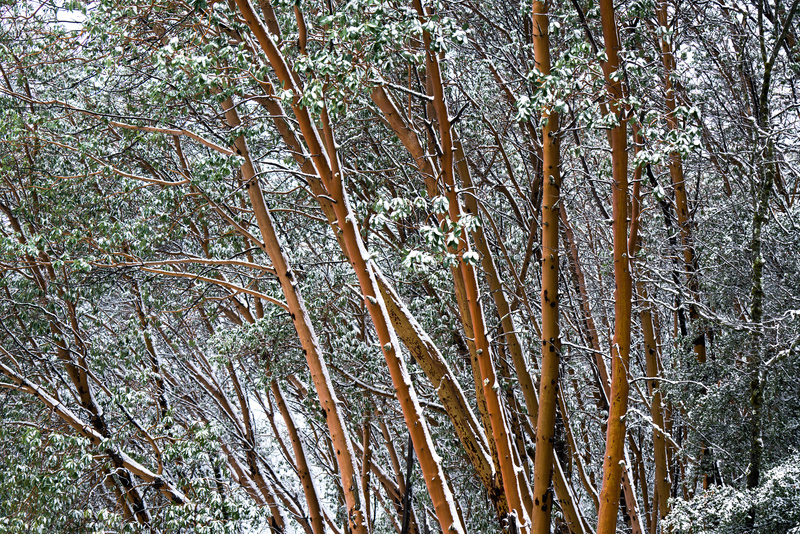 Bay laurel and Pacific madrone trees. 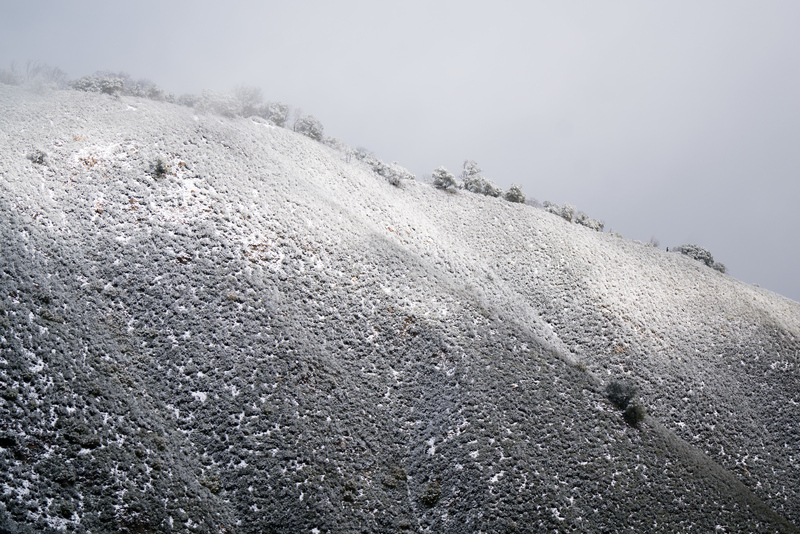 Sunday evening we witnessed the first accumulation of snow near Castle Rock. it’s a crummy pic but fun to see the snow in relation to a point of reference. The green grass photos are my favorite for the same reason. Here's another. This is Mt. Hamilton with downtown San Jose in the foreground. I forgot this photo, we took it together the other night up in the snowy castle rock area. Nice shot well crafted. Believe it or not, this is Maui yesterday. 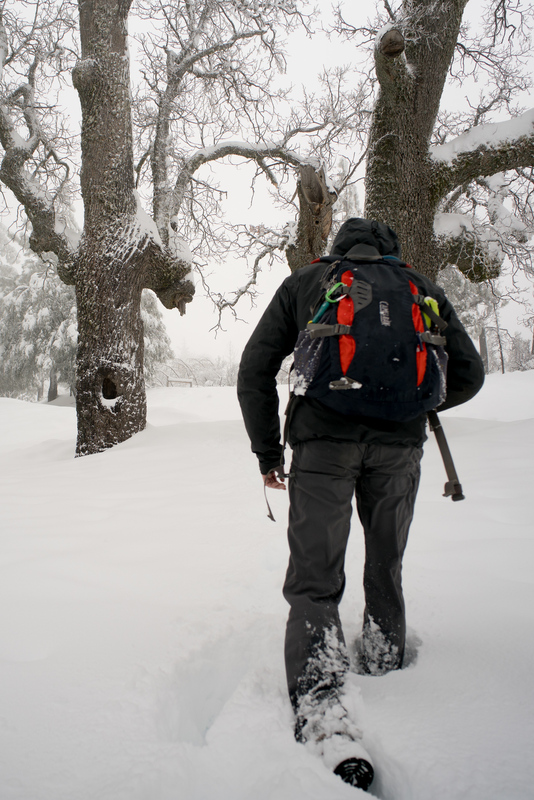 Lowest snowfall ever recorded, approximately 6,000 feet. On the Big Island, atop Mauna Loa saw wind gusts of 191 mph and the lowest temperature ever recorded in Hawaii, 11 degrees Fahrenheit. The Storm that brought this may have produced the lowest barometric pressure on Hawaii. That would be truly amazing for a winter storm to surpass all of the hurricanes that have hit the islands. What is making the Pacific so cold that storms are dumping snow everywhere from Hawaii to California this week? This was the forecast last week when you were up there. I had to screenshot it because never do we see snow in a local forecast. Glad you got up there to capture the snow. 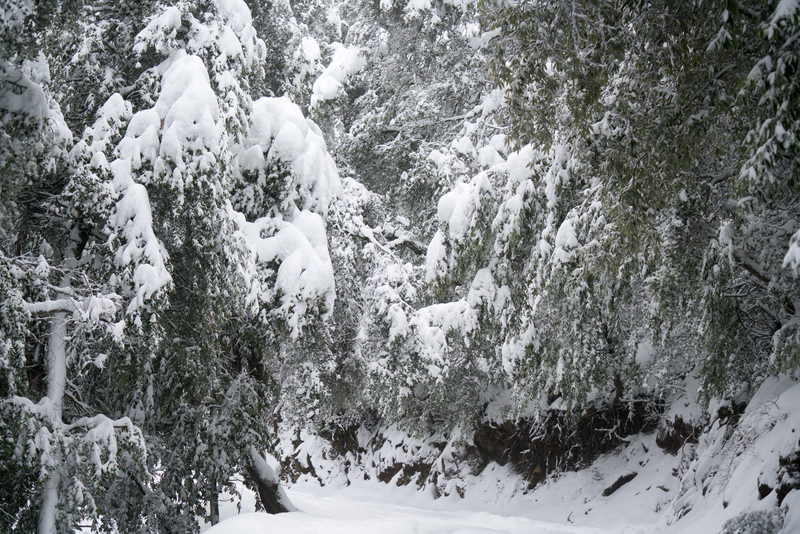 The harsh contrast of vibrant green redwoods and snow is spectacular. A friend sent me a dash cam image of the snow on Highway 17 last Tuesday. Mind blown. It keeps happening! 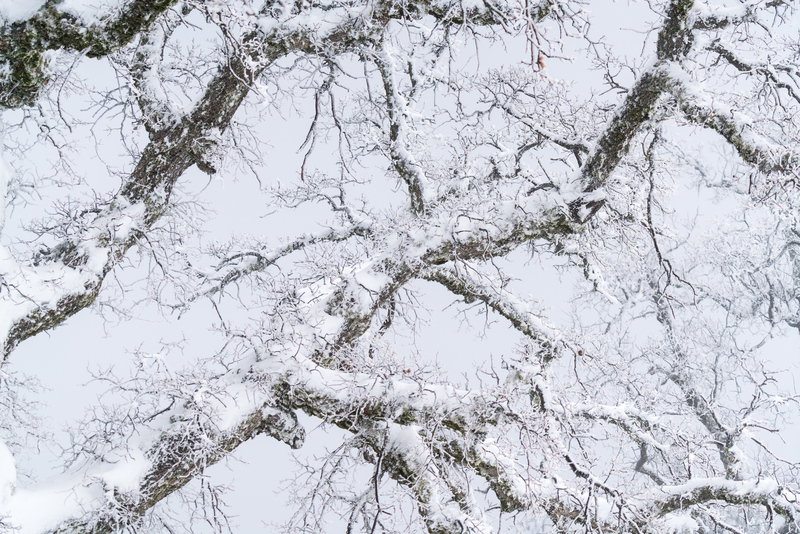 Seattle is now getting record snowfall. A clear reminder of what our climate once was. 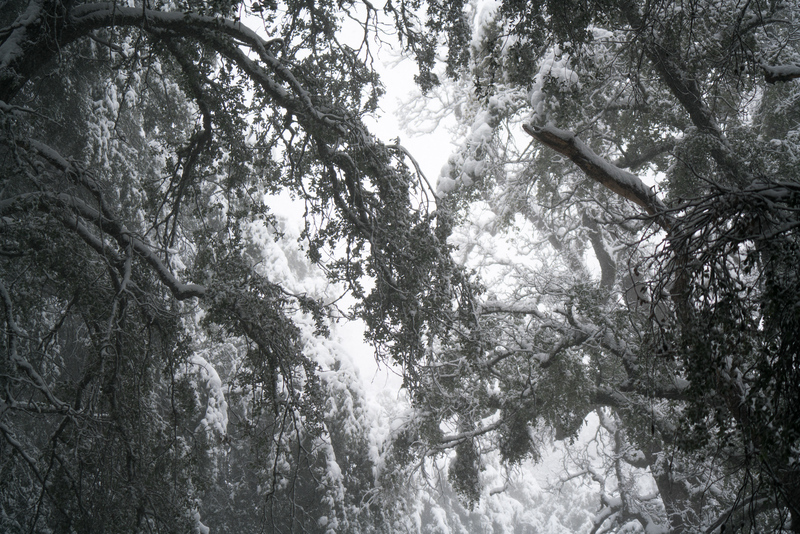 This is reminding me of the stories my grandparents tell about snow falling at sea level in San Francisco. 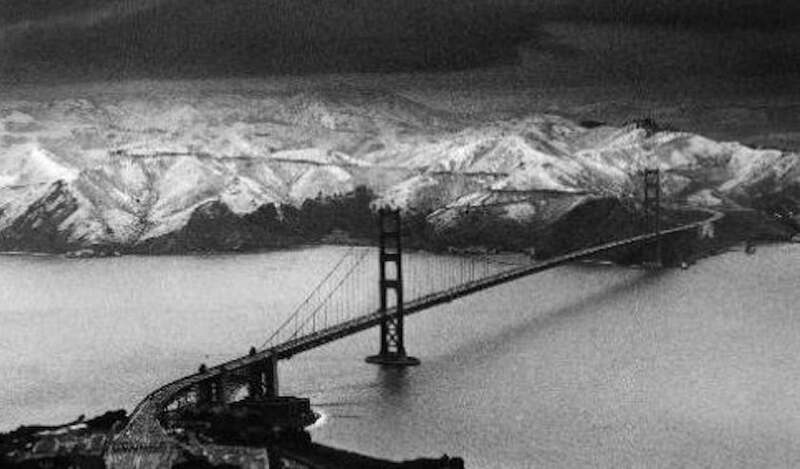 In the 70's, the Golden Gate saw snow. 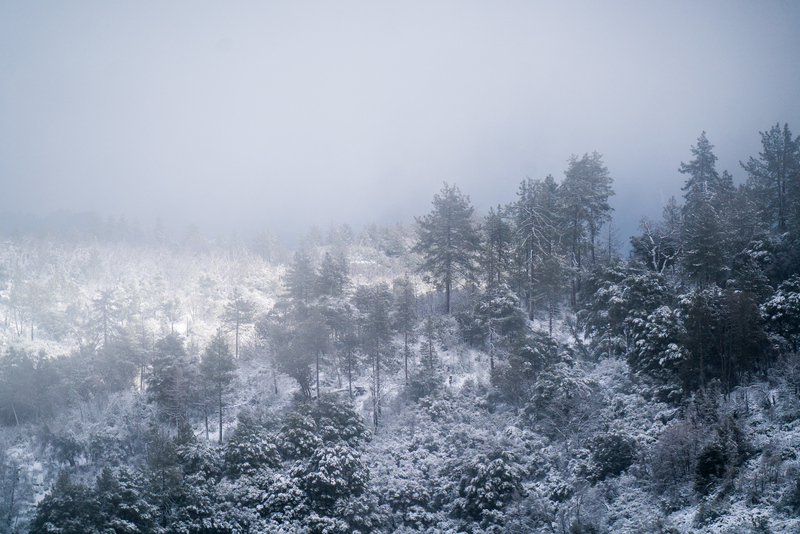 I was showing my grandma my photos of the snow-covered San Lucia Mountains, and she told me her grandma who also grew up in San Francisco frequently experienced snow in the 1800's. I looked it up. 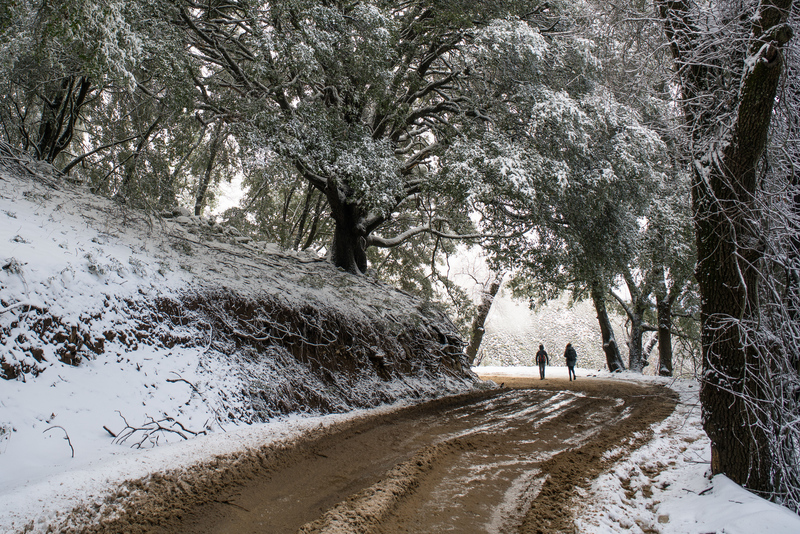 No kidding, snow in SF was about as rare as snow high in the local mountains today.